If you are in the middle of deciding what copier is right for you then there are a lot of things to consider. Many people pay attention to the most common things like print speed, and color options, but one thing is commonly overlooked– warm-up time. Copier warm-up time can greatly affect your business depending on what your office is like. It’s important to understand how copier warm-up time can affect you. Copier warm-up time is the time it takes for your copier to go from being completely turned off to being ready to produce its first print. Warm-up time does not affect everyone in the same way. One business may run in a way that it doesn’t change their daily processes,while another can be crippled by bad warm-up time. Here is the general rule of thumb when it comes to determining if warm-up time makes a difference to you. If you run a smaller business that does fewer, small print jobs then having great warm-up time will probably benefit you more. If your operation is quite large then there is a high probability that you will only turn your office machine on once that day. In this case print speed is much more important than warm-up time. Warm-up time can be tricky to understand because it affects businesses in different ways. 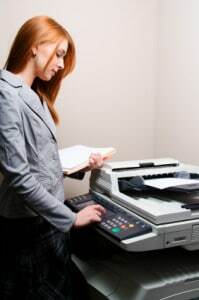 Give us a call if you are confused about copier warm-up time when getting your next copier lease. We would be happy to help you understand warm-up time and get you a machine to match your needs.